March 29, 2010 Dan O. If you meet a guy named this, stay the hell away! 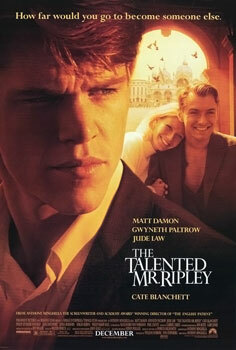 Charming sociopath Tom Ripley (Matt Damon) maneuvers his way into the lush life of a young heir (Jude Law) vacationing in Italy in this increasingly creepy thriller from Anthony Minghella (The English Patient), based on a novel by Patricia Highsmith. The film at first sight, doesn’t seem like it could be what it becomes. It’s nice, sound, and also charming with plenty elements of little comedy here and there, but soon turns into something like no other. Probably in the first hour, the film’s deciding factor already occurs. However, instead of ending on a note like they could have the film continues and gets more into the mind of this very interesting man, Mr. Tom Ripley. The one element I liked of this film was that it was all shot in mostly his point-of-view. We see everything his way, and we get a sense early of who this quiet, awkward man actually is. I have to praise the writing and direction credit from Anthony Minghella. He uses such a great way of film-making by building up the suspense as the film goes on. There are slight moments of creepiness, but never too out-of-hand until the third and last act. You feel like everything in this film is just going to explode, but using slight Hitchcock pointers of suspense, we are left on the edge of our seat because of the unpredictable of the film and its characters. We see the reason as to why this Tom Ripley wants to be somebody else, and why it is his dream and infatuation, of being another person. I especially liked how by the end of the film, Ripley had to come up with things off the top of his head to get him out of certain situations, which dug him deeper and deeper into more and more chaos among the people he knew. Also, I shouldn’t forget to mention the setting, in Italy. The places the film are set in make the film look better, cause of the bright colors you get this sense of good and love, but the story contradicts this beautiful, loving place, with horror. I will say that this film did have a couple of flaws that did bother me a bit. I feel like when Jude Law’s character, Dickie, left the film by the end of the second act, the latter part isn’t the same. I was still entertained don’t get me wrong here, I just wasn’t as taken back by the characters relationship as I was with the first two acts. Also, the character of Meredith (Cate Blanchett), and her obsession with Ripley, seemed a bit too unbelievable and underused to a point where the last confrontation was awkward and meaningless. And I can’t recommend this for everyone cause it certainly it certainly isn’t a film you and your family, or bunch of friends can enjoy. Matt Damon is great and equally as creepy in this film, and proves at an early age he can turn in great performances. Damon, is scary, but also tragic, cause he is a kid that would rather be somebody else and famous for it, than just a random nobody. He makes a total transition half-way through the movie, from awkward quite kid, to charming, talkative two guys, and its all believable. The best performance in the film that is actually the highlight, is Jude Law, because he is so funny, charming, and energetic that when he leaves the film mid-way through we miss his presence and what him back on. Also, Gwyneth Paltrow and Philip Seymour Hoffman appear and make some good supporting jobs here too. Consensus: It’s not for everyone, but The Talented Mr. Ripley, has wonderful performances from the cast, a creepy atmosphere that climbs every minute, and a wonderful job of writing and directing from Minghella. I love this film. Which is even more impressive since it’s one of only two films where I can get on board with Matt Damon. The ending is so tragic, and it’s such an unusual film. Great post.